Magikarp is a poorly known Pokémon in the comic series. Well, after a lot of effort, it can evolve into a mighty Gyrados dragon, but most players who have clashed with Magikarp will know the original of Magikarp – a timid fish. Yet that Magikarp to be loved enough for The Pokémon Company dedicated it to own a game. What is your mission? Grow and train a Magikarp herd to become the highest jump fish in the area. And when you try it, you will find this game crazy, but very interesting. The fish I love is named Trevor. When you’ve finished reading what’s underneath, you’ll understand why I’m still playing this game. In a small town, not Pikachu, Charmander, or Nidoran is the most popular Pokémon. There, people love Magikarp and raise them as ornamental fish, they also have fun bringing Magikarp to contest. This match is not to take Magikarp fight each other but to take the high jump competition see who’s the highest dance jump. Magikarp in the comic series is only good at jumping on the shore, but in the world of Magikarp Jump, they have the ability to jump high respectable! The high jump ability of Magikarp is affected by its JP (Jump Power) index. The higher the number, the higher the jump. You will start the game Pokémon: Magikarp Jump by going fishing in the hope of catching a Magikarp then bringing it to your own tank. Your tank – the home of Magikarp is where a lot of activity takes place. Swipe the screen to see around the house, click on the food to feed the new pet and then, you can decorate the house. Other Pokémon also visits Magikarp’s house, which helps increase your stats when competing. Not only nurturing, you also have the task of turning Magikarp into a fish that can jump to the championship. Initially, you can train by letting the jumping fish hit the sandbag or jumper count, or jump on a tree. The practice will help Magikarp to increase JP, where the score received is random in each execution. Activities are curious, fun. 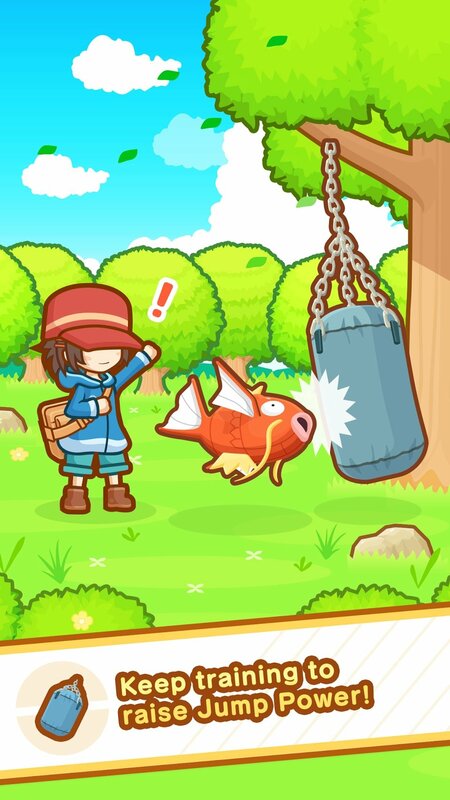 After nurturing and training new friends, you will take Magikarp to fight with other Trainer Magikarp, but not so stressful. You just press the button to jump up and see that they jump higher than the opponent or not. Simple but also nervous to breathe. There are many Magikarp tournaments in the game, with countless badges for you to collect if you get the highest position. The victory also gives you a certain amount of experience points, which increases your character’s level, as well as increasing the JP limit for Magikarp. After the training and competition, you will sometimes see a cutscene. You stand in front of a 50/50 option: play safe or risk your pet for extra experience points. I’m not mistaken – this is a selection of life and death. Train your Pokémon and keep them safe. In the end, let them retire. This was forewarned through a cutscene in sadness and joy in the sunset. I will never forget you, Trevor. Never. Do not worry, after a Magikarp is retired, you can fishing the another Magikarp, the later the Magikarp, the more special indicators, with different colors and patterns. As we grow older, Magikarp evolves with new colors and patterns. And then you will have a collection of different Magikarp types next to the titles. 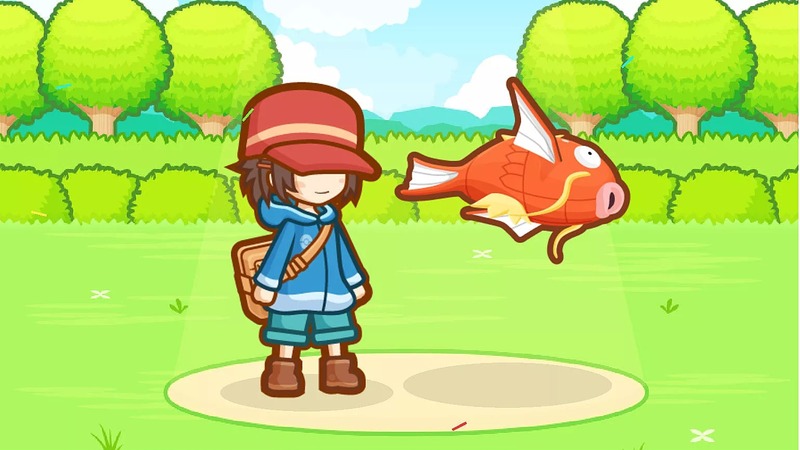 When I first started playing Pokémon: Magikarp Jump, I thought this was a boring game, but the recurring theme of this game contained something interesting and intense. 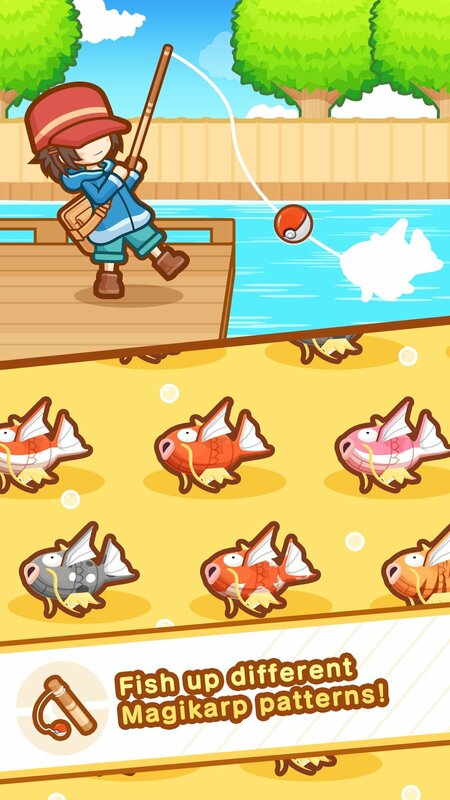 The game balance between farming and gently relaxing in aquarium decorating, besides the main goal is to collect all Magikarp collection. The game is small and does not require too much time, which is good for entertainment. You can refer to some other Pokemon games like Pokemon Quest. When you are free, you can go to the game and feed the fish, or train, and then go to join the contest until Magikarp is exhausted, give it a rest and feed another Magikarp. Magikarp is counting on you. Do not go wrong! Pokémon: Magikarp Jump APK is ready to download! Depending on your needs, you can download Pokémon: Magikarp Jump MOD APK or Pokémon: Magikarp Jump Original APK. Or install from Google Play / App Store if you want.